The actor and his husband got some "Will & Grace"-inspired help when it came to decorating. 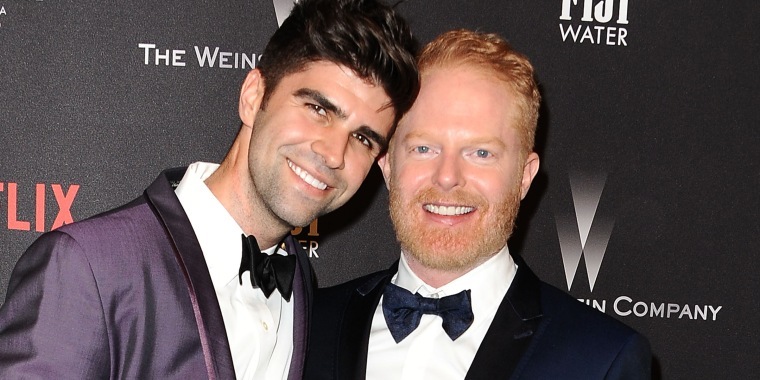 Looks like Jesse Tyler Ferguson is keeping it in the family. Okay, well, the industry at least. The “Modern Family” star worked with “Will & Grace” set decorator Peter Gurski to help design the interior of his Los Angeles home, and the abode now ready for its closeup. In a new feature for ArchDigest.com, the 42-year-old actor showed off the 1928 Spanish Colonial he shares with his husband, activist and social innovator Justin Mikita, 33. Robert Pattinson previously owned the 4-bedroom home, as did Gwen Stefani and Gavin Rossdale, so when Ferguson and Mikita took it over, they made it their own, working with the property’s original Gothic-inflected interior finishes. In the library, the beautiful stained glass windows are hard to miss, but there are other fun focal points, as well. “Anyone who walks into the room is just blown away,” Ferguson said. The room is full of different patterns and colors, and it manages to work perfectly. The home features original painted ceilings, stained glass and ornate wrought iron. The room, which is used as a pre-dinner cocktail area, features a yellow sofa that Ferguson picked out and a plaid love seat that was built for the space. And while the living room is one of the only rooms in the house to be left white (they embraced color throughout), there’s still a bit of a quirky vibe to the space with a giant iron horse standing by the window. In the kitchen, you’ll find a long wooden island and dark green refinished cabinets. Mikita said he still enjoys a clean white look, but they’re planning on doing that for their New York place, which Gurski is helping them out with, too. See more pictures of this fun celebrity home at ArchDigest.com.